Near Field Communication (NFC) is a set of communication protocols that enable two electronic devices, one of which is usually a portable device such as a smartphone, to establish communication by bringing them within 4 cm. NFC devices are used in contactless payment systems, similar to those used in credit cards and electronic ticket smartcards and allow mobile payment to replace/supplement these systems. This is sometimes referred to as NFC/CTLS (Contactless) or CTLS NFC. NFC is used for social networking, for sharing contacts, photos, videos or files. NFC-enabled devices can act as electronic identity documents and keycards. 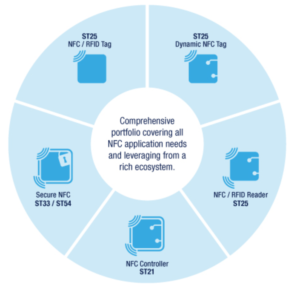 STM in its portfolio has a loot of NFC TAG & Reader. ST25DV TAG series (EEPROM & RAM): ISO15693 NFC forum type 5 certified dynamic tags suited for consumer electronics, industrial, metering, electronic shelf labels IoT objects and more. This TAG is compatible with M24LR TAG. M24LR TAG series (EEPROM): ISO15693 dynamic tags optimized for industrial, metering, healthcare, medical equipment and more. M24SR TAG series (EEPROM): ISO14443-A NFC forum type 4 dynamic tags designed for consumer electronics, wearables, home appliances and more. ST25 READER series provides multiprotocol support for 13.56 MHz NFC / RFID communications as ISO/IEC 14443 Type A or B, ISO/IEC 15693, ISO/IEC 18092, FeliCa and NFC Forum protocols. This entry was posted in RFID/NFC. Bookmark the permalink.